﻿Presented below are elements of an online course that I have developed for asynchronous professional development. You may select a links below to view an artifact. Navigational buttons will advance you through the artifacts to simulate the design process that was used to create this course. for evidence of learning and completion. and experience with the instructional design process to improve instruction through the analysis of learning needs and systematic development of course materials. 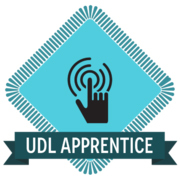 UDL Apprentice Badge. Digital image. Credly. Credly, n.d. Web. 25 June 2015. <https://credlyapp.s3.amazonaws.com/badges/2ec8cefdc4639061518bdce7940ce277_13.png>.